From the begging of May the guards in Bulgarian prisons and arrests (remand prisons) have been protesting a change to their work conditions. Previously they worked 24 hour shifts, then they had 3 days off, now they must work 12 hour shifts with 24 hours off. A 24 hour shift might sound like too much work and the reduction to a 12 hour shift would probably appear to most people as an improvement in work place conditions, however the guards a protesting and planning a national protest in Sofia on the 27th July 2013. So why are the guards and the guards’ union protesting what most people would see as an improvement to work place conditions? Because in practice guards don’t actually work for the entire 24 hour shift, from 08:30 to 20:00 everyday the guards have the majority of their work, after 20:00 all the cells in the prison are locked, apart from the occasional medical emergency, there is nothing for the guards to do from 20:00 until the doors open again the next day at 06:30. This means that for about 10 hours of their previous 24 hour shift they were sleeping, although they are not legally allowed to, the reality is that all the guards fall asleep very soon after 20:30, only waking up when the phone rings or prisoners call for a doctor. The 24 hour shift system had other perks too, previously with 1 day on 3 days off, guards could work second jobs. Despite this being illegal for prison guards and police to have second private employment, it is common practice and the 1 day on 3 days off shift rotation, allowed the guards to work roughly 27 days a month for illegal cash jobs. This means they had the best of two worlds; they received two wages and also accumulated the coveted state employee pension. Now with the 12 hours on 24 hours off, it is almost impossible for most guards to hold down a second job. It also means that in practice the guards will actually be working more. Both in regards to actual time spent in prison and also the fact that there will be more day shifts for the guards, meaning less night shifts, meaning less sleeping opportunities for Bulgaria’s finest. What is the Prisoners’ Association’s stance on the protests? It was argued over, that is for sure. But a consensus was conceded, that in principle the Prisoners’ Association should show solidarity and support the calls to reform the work conditions of the guards. It was also noted that the prison administrations are the cause of most of our strife, both for prisoners and guards. However after having agreed on supporting calls for work place reform in principle, it was also hotly noted that it was hypocritical of the guards to be complaining about their work conditions when these same conditions are our home conditions. Also it was noted that the guards were being hypocritical expecting solidarity from society when they themselves have and do partake in repressive measures when prisoners protest against institutional failures. Just recently guards confiscated pen and paper from a Syrian who was protesting his detention as an illegal border crosser (refugee). The conclusion of the debate was that the Association could only support the guards’ union if guards were held to the same accountability as prisoners, meaning the same law be applied for them as for us, which at present is not the case. To this day, not a single guard has been convicted for assaulting a prisoner. It would also be necessary for guards not to get involved in the political activities of prisoners in regards to repression of peaceful protests such as hunger strikes and mass petitions. Can the guards’ protest be reconciled with the ongoing general protests against the current government of Bulgaria? 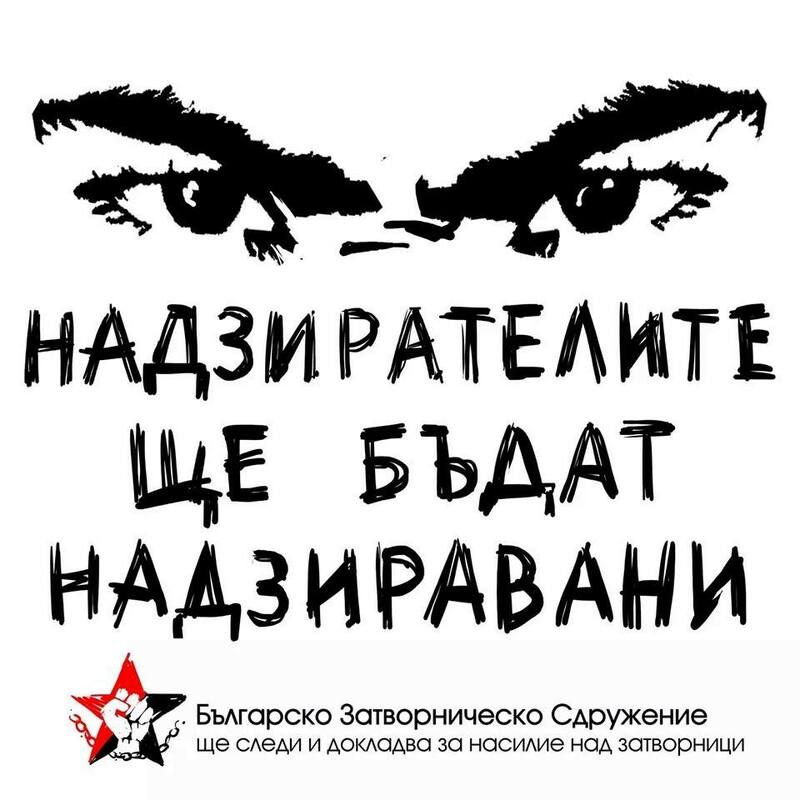 The general atmosphere of the protests sweeping Bulgaria is anti state-ist. It is not simply against the current government. Bulgarians are sick and tired of the entrenched corruption and cronyism that defines the Bulgarian state. The guards being part of that state are just as guilty as all the other corrupt and inept government organs. The guards complain of unsanitary work conditions, however those same unsanitary work conditions are our homes. If the prisons are too dirty for guards, then that goes to show how much worse it is for those of us who actually live 24hours a day here, us the prisoners. The guards on television complained that they must search prisoners’ without gloves and that many prisoners have transmittable diseases, however what was not mentioned in a typically arrogant way, was that guards are searching multiple prisoners without changing gloves per prisoner per search. Sometimes guards wear the same gloves all day and used to search over 100’s of prisoners. In this way the guards are protected, but they are physically transmitting disease between the prisoner populations. Prisoners who demand that they be searched with clean gloves are harassed and in some cases beaten for “arrogance”. Actually the guards are notorious for being less hygienic then the prisoners themselves, many do not have basic hygienic training, many guards do not wash their hands after using the toilet and constantly walk around the prison spitting, even in the corridors and cells where prisoners live. We believe it is hypocritical that they are crying foul of the government when they are in fact the enforcers of the corrupt practices of the same government, state and justice system. So no, the guards’ protest can not be reconciled with the ongoing general protests against the current government and Bulgarian state as they are not the victims of the state, they are the state’s victimizers. The guards are part of problem and have offered nothing constructive to institutional reforms. The guards protesting should be likened to politicians protesting that they don’t want to have to sit in parliament every hearing, despite the fact that they are paid exactly for that. It should be noted, that the governments change in the guards shifts is actually in line with recommendations for prison institution reform. In this regard, the guards’ decision to protest and oppose the changes can be seen as either workers’ rights or reactionary policies of a corrupt prison industry. In reality the guards and prison workers are afforded many privileges, and it can be said that the biggest opposition to prison institutional reform is the institution itself. The bureaucrats and the guards of the local prisons, remand prisons and the national prison body do not want reform policies introduced as the laws are such that the guards and staff can manipulate them in anyway they see fit at the time in question. Frequently the same law is applied in multiple different ways as the laws are so subjective. Really, the guards’ stance is a reactionary one in opposition to state institutional reforms. It is natural for those whom profit from the chaos of such a disorganised country to oppose reforms. Ironically the guards’ 2 biggest objections are both due to illegal practices, that of working a double cash job and that of sleeping on the job, which must be said results in lengthy delays when prisoners are in need of immediate medical attention after 20:30 at night. Guards have to be woken up by prisoners shouting sometimes up to 100 metres away and in a different block of the prison. Reaction time to medical problems normally is about 20 minutes but can be over 30 minutes. The change to the shift rotation of prison guards will be a positive change for prisoner safety especially during the nights as guards will be less likely to be sleeping if they have not worked the previous day. The government should make accountability its first priority, so as to reduce human rights violations committed by guards. The free reign that has been afforded Bulgaria’s state workers has to stop and transparency needs to be implemented. The guards protesting are like teething babies who are denied their mothers milk and instead are given solid foods to eat. It’s time for the guards to grow up and stop resisting the reforms of the Bulgarian state that do not go far enough but are reforms none the less.